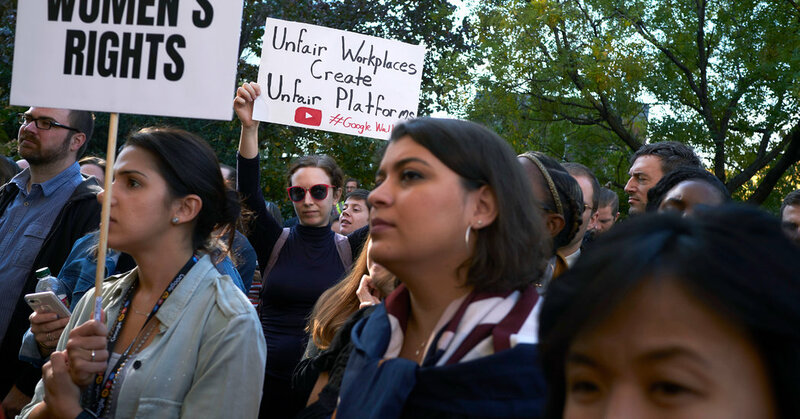 SAN FRANCISCO — Google said on Thursday it would end the practice of forced arbitration for claims of sexual harassment or assault after more than 20,000 employees staged a walkout last week to protest how the internet company handles cases of sexual misconduct. Workers at Google had called for an end to arbitration, among other reforms, as part of the walkout. The protest was prompted by a New York Times article last month that revealed the company had given a senior executive, Andy Rubin, a $90 million exit package even after it found he had been credibly accused of sexual harassment. Google will also overhaul its reporting process for harassment and assault, provide more transparency to employees about incidents reported to the company, and dock employees in their performance reviews if they do not complete mandatory sexual harassment training, Mr. Pichai wrote in the email, which was obtained by The Times. Google plans to hold a companywide meeting Thursday morning to address its workplace culture and respond to employee concerns about sexual harassment, according to a separate email sent to employees by Eileen Naughton, Google’s vice president of people operations. Around 20,000 Google employees walked out of work — including in Singapore, London and the company’s headquarters in Mountain View, Calif. — last Thursday to show their dissatisfaction over the handling of sexual harassment cases. The employees said they had several demands, including the ending of forced arbitration, more transparency and appointing an employee representative to its board. Google’s employment contract had included a clause requiring employees to deal with any grievances with the company in private arbitration. Arbitration, a common practice among technology companies, largely happens behind closed doors and can involve confidentiality clauses. The practice has come under scrutiny, especially as it relates to sexual harassment, because it limits workers from speaking out about their experiences. Microsoft and Uber have recently ended arbitration in cases of harassment and assault, so that employees do not have to choose between speaking freely about what happened and resolving them with the company.